The public’s views of local job availability continue to improve. Currently, 50% of Americans say there are plenty of jobs available in their communities – the highest number saying that jobs are plentiful in Pew Research Center surveys dating to 2001. Since June 2016, the share saying plenty of jobs are available has increased seven percentage points, from 43% to 50%, with virtually all of the change coming among Republicans. Yet in both parties, perceptions of the local job situation are much more positive today than they were three or four years ago. However, the public’s brighter outlook on jobs has not been matched by comparable improvement in views of whether people’s incomes are keeping pace with the cost of living. Currently, 49% saying their family’s income is falling behind the cost of living, while 40% feel they’re staying about even and just 9% feel like they’re getting ahead. These views are little changed over the past two years, though the share saying they are falling behind financially is lower today than in 2014 or early 2015. The new national survey by Pew Research Center, conducted Oct. 25-30 among 1,504 adults, finds that views of the national economy continue to be much more positive than they were last December, after the presidential election. Currently, 41% rate economic conditions as excellent or good, while 59% say they are only fair or poor. The share of Americans viewing current economic conditions as excellent or good is virtually unchanged since February (42%), but higher than last December (31%). Since December, positive views of economic conditions have surged among Republicans and Republican-leaning independents (from 14% then to 57% today), while declining among Democrats and Democratic leaners (from 46% to 30%). By contrast, economic optimism, which also rose in the months after the election, has subsided since then. Currently, 32% expect economic conditions to be better a year from now, 29% say conditions will be worse, with 37% saying conditions will about the same as today. In February, somewhat more (38%) thought the economy would improve, while 32% thought it would get worse and 28% said it would stay about the same. For many, it’s too early to attribute the economy’s overall performance – good or bad – to Donald Trump’s economic policies. Less than a year into his administration, 49% say his policies have not had much of an effect on economic conditions; of those who do see an impact, more think his policies have made the economy better (29%) than worse (18%). Partisans take starkly different views of Trump’s economic impact. Most Republicans (63%) say Trump’s policies have made the economy better. By contrast, 64% of Democrats say they haven’t had much effect. While the public’s views of the economy were far more negative at a comparable point in Barack Obama’s first year in office than they are today (just 8% rated economic conditions positively), views of Trump’s influence on the economy are not all that different from public assessments of Obama’s impact. In October 2009, 42% said Obama’s policies hadn’t had much impact on the economy, compared with 31% who said they had made things better and 20% who said they had made things worse. In 2009, views of Obama’s impact on the economy were also highly partisan, though the share of Democrats who thought his policies had improved the economy in late 2009 (47%) was somewhat smaller than the share of Republicans who say this about Trump’s policies today (63%). 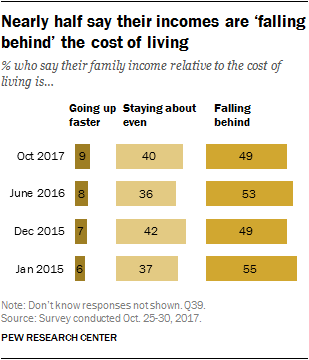 About half (49%) of all Americans now say their family’s income is not keeping pace with the cost of living, while 40% say they are staying about even and just 9% say their income is going up faster than the cost of living. As in the past, those with lower incomes are the most likely to say they are falling behind. Today, two-thirds (67%) of those with incomes of $30,000 or less per year say they feel like they are falling behind the cost of living. By comparison, those with incomes of $75,000 or more are far less likely to say this (33%). Older Americans also remain more likely than younger people to report that they are falling behind. While only 34% of those younger than 30 report feeling like their incomes are falling behind the cost of living, that figure rises to 55% among those 50 and older. Today, Democrats and Democratic leaners (56%) are significantly more likely than Republicans and Republican leaners (37%) to say that their income is falling behind the cost of living. The reverse was true in surveys conducted from 2014 through 2016, during the Obama administration; however, the size of the partisan gap was somewhat less pronounced in that period than it is today. 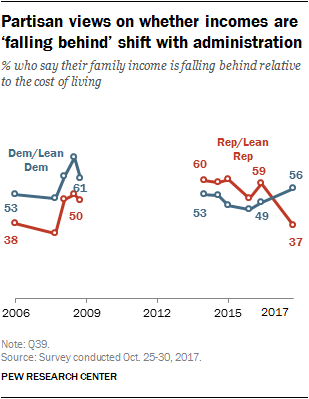 The share of Democrats who now say their incomes are falling behind the cost of living is seven percentage points higher than it was in June 2016 (56% today, 49% last year), while the share of Republicans who now say their incomes are falling behind has dropped 22 percentage points since last year (37% now, 59% then). Reflecting a similar partisan pattern, Democrats were more likely than Republicans to say their incomes were falling behind the cost of living in surveys conducted throughout the second term of George W. Bush’s presidency. Today, 50% of Americans say there are plenty of jobs available in their communities, the highest share saying this in Pew Research Center surveys dating back to 2001. At the same time, 41% now say there are plenty of “good jobs” available. The current gap between the two measures is similar to past surveys. As with other economic measures, Republicans and Republican leaners have more positive views of the job situation than do Democrats and Democratic leaners. Nearly six-in-ten Republicans (58%) now say there are plenty of jobs available in their local communities, compared with 47% of Democrats. Since the question was last asked in June 2016, GOP views have become considerably more positive (from 41% who said plenty of jobs were available then to 58% who say this today). Democratic views are little changed over this period (45% then, 47% today). By contrast, following the economic recession and throughout most of the Obama presidency, Republican and Democratic views on this measure tracked together. However, the current gap is similar to the partisan divide in these views during the George W. Bush administration, when Republicans were consistently more likely than Democrats to say plenty of jobs were available in their communities. The partisan gap is even more pronounced on the question of whether “good jobs” are available (half of respondents are asked about “job” availability, half are asked about “good jobs” availability). While 57% of Republicans say there are plenty of “good jobs” (little different than the share who say there are plenty of jobs), just 32% of Democrats say this. Across both questions, higher-income Americans are more likely than those with lower incomes to say plenty of jobs are available in their community. Nearly two-thirds (65%) of those with annual family incomes of $75,000 or more say there are plenty of jobs available in the community where they live, compared with 46% of those with incomes of less than $30,000. And while just 26% of those with annual incomes under $30,000 say there are plenty of “good jobs” available, that rises to 53% among those with incomes of $75,000 or more. How have Trump’s economic policies affected economic conditions? 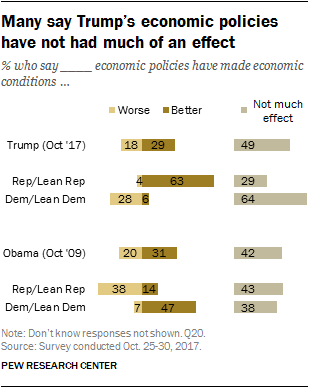 About half (49%) of U.S. adults say that Trump’s economic policies have not had much effect on economic conditions, while those who do say they have had an effect are somewhat more likely to say they have made the economy better (29%) than worse (18%). About six-in-ten (63%) Republicans and Republican leaners say that Trump’s policies have improved the economy, while 29% say they have not had much effect (just 4% say they have made economic conditions worse). Most Democrats and Democratic leaners (64%) say that Trump administration policies have not had much effect either way, while 28% say they have made the economy worse and just 6% say they have made the economy better. Within both parties – but particularly within the GOP – there are differences in these views across income groups. About three-quarters (73%) of Republicans with annual incomes of $75,000 or more say that Trump’s policies have made economic conditions better, compared with 44% of Republicans with incomes under $30,000 (39% of whom say Trump’s policies have not had much of an effect so far). Though majorities of Democrats at all income levels say Trump’s policies have not had much of an effect, this view is more widely held among higher-income Democrats. Those with lower incomes are somewhat more likely to say Trump’s policies have worsened economic conditions. 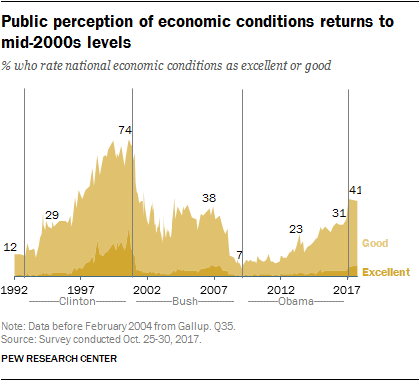 Perceptions of economic conditions are little changed since February (42%), when positive views of the economy reached their highest point in a decade. Today, a 57% majority of Republicans and Republican leaners characterize national economic conditions as excellent (10%) or good (47%). Among Democrats, just 30% say the same. 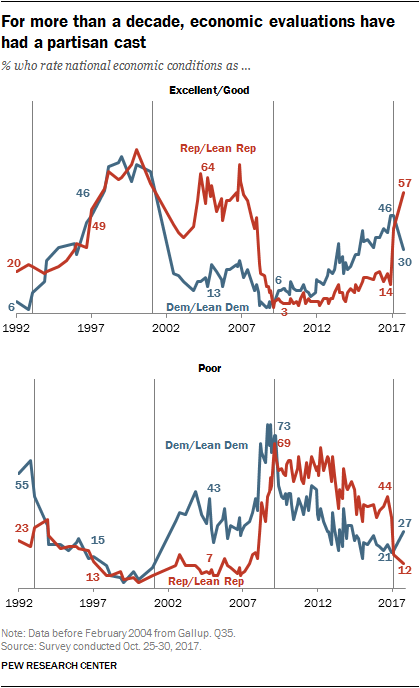 At the same time, Democrats are roughly twice as likely as Republicans to describe current conditions as poor (27% vs. 12%). Throughout much of the Obama administration, Democratic ratings of the economy were considerably more positive than Republican assessments. For instance, as recently as December 2016, just 14% of Republicans said the economy was in excellent or good shape, compared with 46% of Democrats. 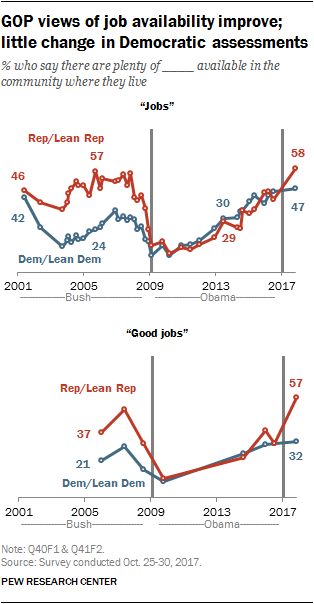 This pattern of views of the economy being more positive among those who share the president’s party was also apparent throughout much of George W. Bush’s administration (briefly narrowing at the height of the economic crisis in late 2008 and early 2009, when clear majorities of both Democrats and Republicans rated economic conditions as poor) and at the tail end of the George H.W. Bush administration (when the question was first asked by Gallup). During Bill Clinton’s presidency, Republican and Democratic views tracked one another more closely. Looking ahead, the public has mixed views of how they think the national economy will perform over the next year. About as many say conditions will be better in a year (32%) as say they will be worse (29%); 37% think they will be about the same as they are now. The public’s outlook is somewhat less positive than it was in February. At that time, slightly more thought the economy would improve (38%) than worsen (32%) over the coming year. Nearly two-thirds of Republicans and Republican leaners (63%) expect the economy to be better in a year, compared with just 8% who think it will be worse. Democrats are much less optimistic about the economy’s direction than Republicans: 44% think conditions will be worse in a year, while an identical share says they will be about the same as now; only 10% expect the economy to be better in a year. 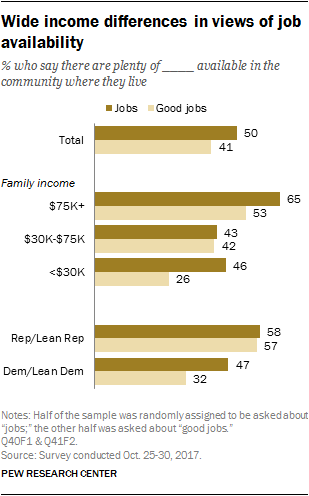 Higher-income Republicans are more optimistic about the economy than lower-income Republicans. About two-thirds (66%) of Republicans in households earning $75,000 a year or more think economic conditions will be better in a year. Among Republicans in households earning less than $30,000 a year, 53% say this. Republicans reacted to the start of Trump’s presidential administration with a burst of economic optimism. The share expecting the economy to be better in a year went from just 28% in September 2016 to 75% in February, shortly after Trump’s inauguration. 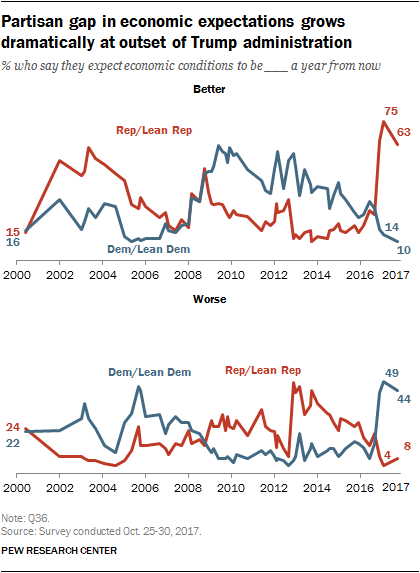 The share of Republicans and Republican leaners expecting the economy to improve over the next year has pulled back somewhat from February (63% in the current survey), but remains higher than at any other point in more than a decade. Democratic views have moved in the opposite direction. As a result, the partisan gap in economic expectations has been wider in the first year of the Trump administration than at other points in Pew Research Center surveys over the course of the last two decades. In September 2016, just 16% of Democrats and Democratic leaners thought the economy would get worse in the coming year. That share spiked to 49% in February after Trump’s election and stands at 44% in the current survey. Just 10% of Democrats now think the economy will improve in the next year.